Age 14/15/16? | 1982/83? Awww…. that’s nice. People being burned alive. Wow, Leia is still being a cow. Talk about wanting to cut off your nose to spite your face! She’s lucky she doesn’t get thrown out the airlock. Goes to show that Solo’s love is blind, I suppose! I seem to have got fairly expressionistic in panel 1. didn’t I? That weird pink shape around the falcon’s afterburners. The snowtroopers didn’t get incinerated as the Falcon blasted away in the film or the Marvel version. But it’s okay, the young me corrected that. 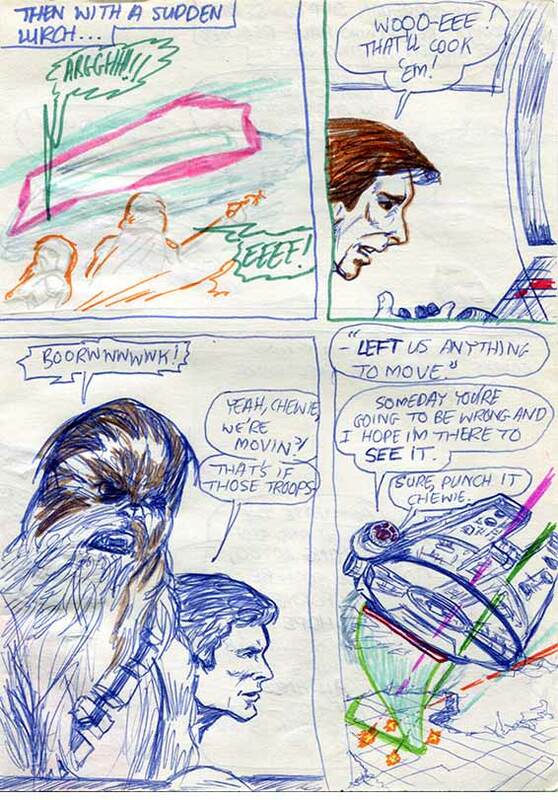 That side-view of Solo in panel 3 has got to b a copy from somewhere else. Probably from Al Williamson’s Marvel comic art, but I’m not sure which. I’m still building my new professional illustration portfolio website—in WordPress—and it’s going well. Slow work, so many decisions to make, but it’s getting there. Stay tunedand I’ll post a link when it’s all ready to go live. We’re almost snowed-in here in Ireland at present. It’s our heaviest snow since 1982! I have to say, it’s fantastic fun. My son Johnny can barely remember the last time we had heavy snow, in 2010, when he was about 4 years old, so he’s loving it. It’s a thrilling novelty for him. We’ve had great fun sleighing (on a sheet of corrugated plastic! ), snowball fighting and building a snowman. Official Code Red! From yesterday at 4pm the government actually advised all citizens to stay indoors for at least 13 hours! It was pretty bad out there. Still is actually, constantly snowing. Anyway, the school’s are closed or three days, the kids—especially the ones who’ve barely seen snow before—are having fun and getting outside with their pals. To me, that’s more valuable to them than 3 days in a classroom. Hope you’re safe where you are, and have great weekend!